“For me, the 25th April 2015 started just like any other Saturday morning. As it was a day off from work, I spent the morning relaxing at home, sending some emails to friends back in Ireland and then playing guitar. At 11.56am, I felt a strange rumbling noise in the distance, which I presumed was a bulldozer or a big truck going past near my flat. A couple of seconds later, the noise got louder and louder until the windows started shaking, doors started swinging on their hinges and plates and glasses started to fall of the shelves in the kitchen. This was an earthquake. I followed the procedure I had learned in Umbrella’s Earthquake Preparedness Training Programme and dropped to the ground and covered my head until the shaking stopped. I then went outside to find buildings had collapsed, phone networks had dropped and people were gathering in open spaces as aftershocks rocked through Kathmandu. I made my way to the Umbrella houses in Swayambhu and was relieved to see that our children, volunteers and staff were alive and safe and that our buildings were still standing. We set about making a camp by fetching blankets, mattresses, food, drinking water, soap, gas canisters and a stove and as the aftershocks continued, we realized we could be camping outside for a long time. Post-earthquake procedures state that you should not re-enter a building within 3 days of an aftershock so we prepared ourselves for a long stay outdoors. 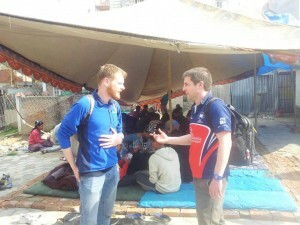 With limited access to phones, electricity or internet, it was hard to find out about what was going on around Nepal. However, this didn’t stop our dedicated staff from contacting the reintegrated children and youths who live around Kathmandu and in the surrounding districts of Rasuwa, Nuwakot, Dhading and Sindupalchowk, which we learned were some of the most heavily affected regions. With every child that was confirmed safe came a sigh of relief, however the aftershocks continued for many days afterwards, which kept us on our feet. Jack and Stephen talking at Camp Umbrella. 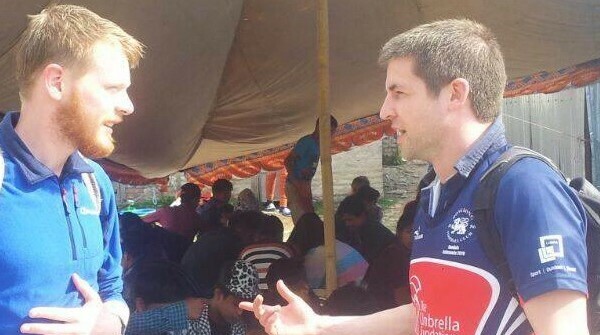 Watch some of Jack’s video updates from Nepal in the immediate aftermath of the earthquake on our Facebook page here and here. He did a great job representing Umbrella and describing the situation in Nepal as he spoke on the 6pm evening news on RTE in Ireland which you can see here. “However, none of the work of our staff on the ground would be possible without our supporters around the world. The reaction to the earthquake around the globe in terms of both fundraising and awareness raising has been phenomenal! I would like to take this opportunity to thank everyone who has organized or attended a fundraiser, spread the word about The Umbrella Foundation or donated personally. We have had a difficult time so far and even tougher times lie ahead as Nepal faces a long recovery process, however the support and messages of solidarity from the Umbrella community have been amazing. Jack supporting fundraising efforts back in Ireland. 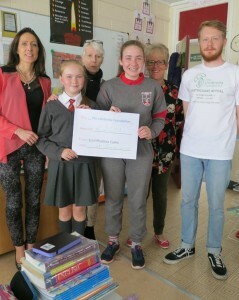 Here pictured with pupils who fundraised at Scoil Phádraic Cailíní in Donabate. Jack is currently back in Ireland supporting fundraising and awareness raising efforts to aid the long term recovery of Nepal. Thanks for your incredibly positive attitude and all your hard work Jack brother in such challenging circumstances! !